Welcome to Best Western Plus Universal Inn! Best Western Plus Universal Inn in Orlando is directly across from Universal Studios , Harry Potter & the Island of Adventure , so guests can walk to their destination. Hotels near Universal Studios Orlando cant compete with our amenities. The Universal Studios Best Western is the closest hotel to the Holy Land Experience at just 1.5 miles away. Guests at our Orlando hotel can enjoy free scheduled transportation to Universal Studios , SeaWorld and Wet n Wild . However, every great adventure should start with an epic breakfast. A free, full hot breakfast greets guests every morning, and includes buttery waffles, fresh pastries and fruits, a selection of cereal and yogurt, and 100% Arabica coffee or cold juice. Many of our Orlando hotel guests are here to visit Disney World . The happiest place on earth is even more enjoyable when you dont have to travel far to get there. NASCAR s Daytona 500, located just 45 minutes away, with our easy access to I-4 and low rates during 500 Race week, we are a fan favorite hotel. Our property boasts excellent reviews from existing customers in all media outlets. A convenient and flexible group booking system attracts a lot of churches and high schools to our Orlando hotel. Were happy to work with groups and blocked rooms. A friendly and multilingual staff makes every guests stay just a little more special, and free wireless Internet is available throughout the hotel. Small, locally owned companies also bring business travelers to our Orlando hotel, and DB accounts are set up directly with our hotels management. If youre lucky enough to be here on business, make sure youre close enough to the attractions to squeeze in plenty of leisure time. 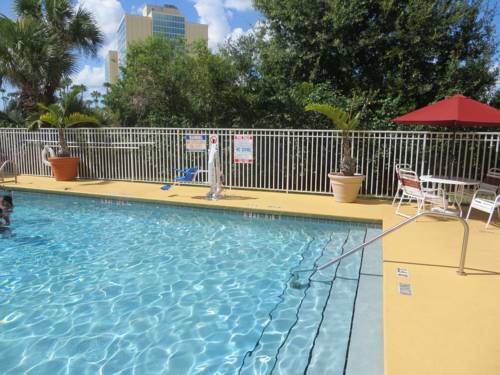 Whether you want to spend your time off the clock at Disney World or swimming with the dolphins, its just minutes away. Reserve a spacious Best Western Plus Universal Inn room today and save! Enjoy your stay. Pool - Accommodations for the physically challenged: TDD phones, Pool lift.